What is a Hip/Knee Replacement? The hip/knee joint is one of the largest joints in the human body and is what is known as a “ball and socket joint”. In a healthy hip\knee joint, the bones are connected to each other with bands of tissue known as ligaments. These ligaments are lubricated with fluid to reduce friction. Joints are also surrounded by a type of tissue called cartilage that is designed to help support the joints and prevent bones from rubbing against each other. The main purpose of the hip/knee joints is to support the upper body when a person is standing, walking and running, and to help with certain movements, such as bending and stretching. 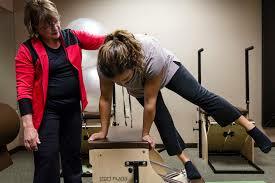 Can Pilates benefit Hip/Knee Replacement? In general, 9 out of 10 people experience dramatic pain relief after a replacement but living with an artificial joint poses new challenges. Some people going in for surgery expect that they will be able to use their new artificial joint just like a natural one but without all the pain. After working with several clients both before and after a replacement I can see that getting used to a new joint takes time and a whole new approach to movement. 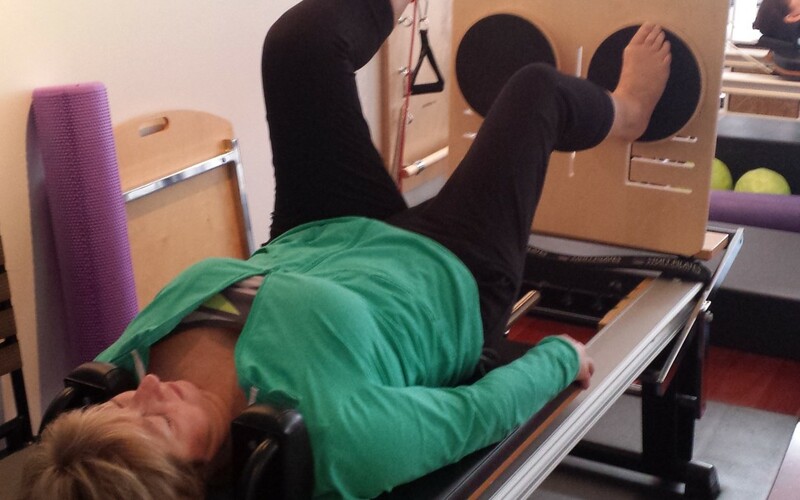 Pilates is the ultimate rehabilitation workout for these clients. Prior to surgery they lived with pain for many years, sometimes even decades. This pain created compensation strategies in their bodies that won’t be fixed by simply replacing the joint. Even though the pain is gone now, the body is still used to moving as if it were protecting the painful area. Plus the limited range of motion in the joint as well as the “unnatural” sensation experienced by some of the post-replacement population makes regular daily activities as well as traditional exercise more challenging and sometimes even dangerous. Pilates offers just the right approach to rebuild balanced movement patterns in the body as well as maximize the benefits of the artificial joint. Can Yoga benefit Hip/ Knee Replacement? Proper exercise after surgery can reduce stiffness and increase flexibility and muscle strength, so yoga is a good thing for this condition. But how much and how soon are dependent on many factors such as physical health before the surgery and presence of chronic conditions that may affect the speed of healing. In the past this surgery was reserved mostly for older patients, as artificial hips didn’t last as long as they do now, and having a repeat hip/knee replacement is possible but not desirable. But as technology has improved, so has the number of years the prosthetic parts can be relied upon to serve their purpose. So now it is more common to see hip/knee replacements in younger people, who may be in better overall physical condition and who will heal faster. Can Rehabilitation benefit Hip/ Knee Replacement? Recovery from a major surgery such as a hip/knee replacement can be a long process; patients will often get discouraged by the slow speed at which their energy levels and range of motion return to normal. One of the major benefits of using aquatic therapy for hip rehabilitation is that patients seem to enjoy it more. There’s no question that keeping spirits up and making hip rehabilitation fun is a major challenge clinicians face — many find that putting aquatics at the core of a hip replacement rehab protocol leads to more positive patients who are less frustrated by the pace of their recovery.